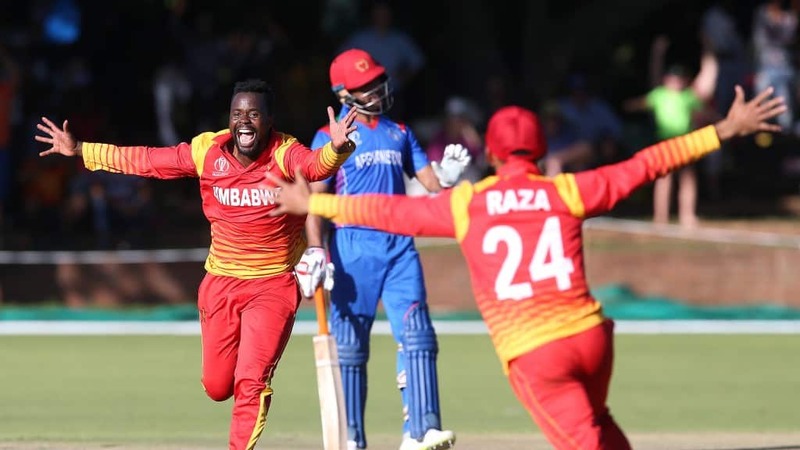 Zimbabwe made short work of the United Arab Emirates (UAE) as they eased to a comprehensive seven-wicket victory in the first One-Day International at Harare Sports Club today. The chevrons were on top right from the start, as fine pace bowling from Kyle Jarvis and Tendai Chatara shattered the UAE top-order batting with such force that the team could not recover. Set only 111 to win, Regis Chakabva, who equalled a Zimbabwe wicket-keeping record during the match, and Craig Ervine led their team to victory without difficulty to take a one-nil lead in the four-match series. Zimbabwe won the toss and put the UAE in to bat on a pitch with a greenish tinge. Jarvis and Chatara opened the bowling to Ashfaq Ahmed and Rohan Mustafa. Zimbabwe nearly struck in the first over, as Jarvis found the edge of Mustafa’s bat, but Chakabva, diving far to his left, was just unable to hold a very difficult chance. Jarvis did strike in his second over, however, moving a ball in to Ahmed, the century-maker of the warm-up match, and trapping him lbw for two. Chatara soon struck from the other end, as Ghulam Shabber, attempting a drive, was given out caught at the wicket by Chakabva for two, and the UAE were seven for two wickets. The first boundary of the innings came as the next man, Chirag Suri, tried to hook a short ball from Chatara and edged it over the keeper. Chatara struck back in his next over, though, as Suri edged a simple catch to Chakabva and the score was now 19 for three after 10 overs. Jarvis was given a break after five overs for eight runs and a wicket, and Donald Tiripano came on to bowl. He did not find his best form to start with, and Shaiman Anwar drove him over long-off for a six. Anwar showed aggressive intent, and made 11 off 15 balls before he pushed unwisely outside the off stump to edge a ball from Tiripano to the keeper; 38 for four, with opener Mustafa still there on nine. Sikandar Raza replaced Chatara, bowling very accurately, and the batsmen struggled to score as Tiripano found his form. In five overs they scored only two runs between them before Mustafa, in desperation, lashed out at a good ball from Raza and was comprehensively bowled for 10, which took him 45 balls. With their first five batsmen all gone, the UAE were 40 for five wickets. Mohammad Usman was the next to go, driving at Tiripano without getting over the ball and sending a comfortable catch to mid-off; he had scored just one run off 29 balls and the score was now 42 for six. Tiripano was rested after bowling eight overs for the excellent figures of two for 18, and Jarvis was brought back in the hope that he would finish off the innings. Mohammad Boota and Imran Haider, however, fought back with determination, choosing their strokes well and maintaining a positive approach. They put on 29 runs in 11 overs before Brandon Mavuta was put on to bowl, and he quickly removed Haider, caught at the wicket for 10 off 26 balls as he tried to dab a ball to third man; 71 for seven. The captain, Mohammad Naveed, decided to take the initiative and drove his second ball from Mavuta for six. He did not last long, however, and attempting a pull off Chatara with his score on nine, he edged a fifth catch of the innings to Chakabva behind the stumps; 80 for eight in the 37th over. Of Zimbabwe’s wicket-keepers, only Andy Flower, twice, has taken five catches in an innings in an ODI. Boota continued to fight, hitting Mavuta for leg-side six, and had Sultan Ahmed as his new partner. He brought up the team hundred in the 42nd over, but one run later was beaten and bowled by Mavuta after a fine fighting innings of 36, scored off 76 balls; the next highest innings in his team was 11. The last pair also proved to be stubborn, but the innings came to an end at 110, as Jarvis returned and bowled Sultan Ahmed (7) with a well-disguised slow yorker, leaving Qadeer Ahmed not out with two. Chatara had the best bowling figures of three for 25, while there were two wickets each for Jarvis, Tiripano and Mavuta. Jarvis’ figures of two for 11 off 7.5 overs were particularly impressive, and he certainly put the skids under the UAE top order. When Zimbabwe replied after lunch, Solomon Mire and Chakabva opened the batting to the bowling of Naveed and Qadeer Ahmed. The batsmen attempted nothing spectacular but could afford to take their time in reaching a comparatively small target, although Mire survived a difficult chance to backward point when he had 10. It did not cost the UAE much, though, as in the next he over moved too far across his stumps and was trapped lbw for 11, the total being 21 for one wicket in the eighth over. Next in was Craig Ervine, Zimbabwe’s current in-form batsman. He played himself in calmly, and then simply waited for the bad balls and punished them. As victory drew closer, Chakabva and Ervine both opened up more and played some fine attacking strokes. The batsmen went through the thirties together, but it seemed that there would not be quite enough runs required for both to reach their fifties, although one of them probably would. On reaching the forties Ervine pulled in front with a four and a pull for six off Haider. He was on 49 when the team hundred came up off 21 overs, and then a straight drive for a single took him to his fifty off 40 balls. Next ball, however, he lost Chakabva, who swung across the line and was bowled by Haider for 38. Sean Williams came in and was no doubt grateful to get a leg-side ball from Haider first up, which he could swing to long leg for four. In the next over Ervine uncharacteristically gave his wicket away with only a boundary stroke needed for victory; he chipped a ball from Mustafa straight to long-on to be out for 51 off 46 balls. Williams, five not out, and Timycen Maruma, four not out, completed the victory without difficulty, and with more than half the 50 overs to spare. The next match takes place at the same venue on Friday.